petition: NATURAL BRIDGE ZOO, IT'S TIME TO SEND LONELY, ABUSED ASHA TO SANCTUARY! Asha the elephant has spent the last 31 years of her life alone in a Virginia roadside zoo, forced to give visitors rides in the sweltering summer heat and humidity. She needs to be sent to a sanctuary! When Asha isn't being used like an amusement park ride, she spends her time in a tiny barren paddock. With little shade, no pool, or toys for stimulation, she simply stands there rocking back and forth out of boredom and depression. During the winter months, when the zoo shuts down for the season, a U.S. Department of Agriculture (USDA) investigation found that Asha spends most of her time in a very damp, cold barn with a concrete floor. Keeping her in these types of enclosures can lead to all kinds of mental and physical ailments. Despite numerous USDA investigations resulting in suspended licenses and heavy fines, the Natural Bridge Zoo remains open. And Asha remains one of its biggest attractions. But how much longer can she last in these deplorable conditions without any interaction with other elephants? This is not the life that elephants are meant to live. In the wild, they live in tight knit communities and roam for miles. They certainly don't spend any time standing in the snow or on cold concrete floors. Asha is being abused for human entertainment and financial gain. 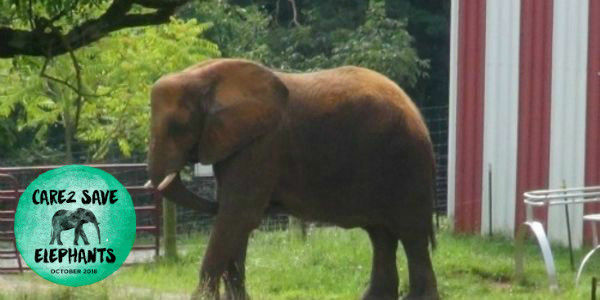 So sign this petition right now to demand that the Natural Bridge Zoo send Asha to The Elephant Sanctuary in Tennessee. There, she would have the opportunity to roam acres of natural habitat, play in a pond, forage for fresh vegetation, befriend other elephants, and enjoy a full, healthy, and enriched life.